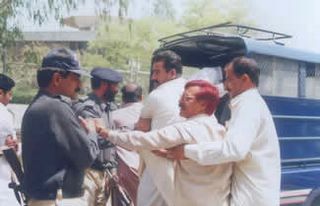 Police continued cracking down on Pakistan People’s Party (PPP) activists on Thursday and arrested thousands of them from all over the country while Pakistan Railways (PR) cancelled and barred group reservations in trains bound for Lahore till April 16. The PPP claimed the government had arrested about 20,000 party leaders and activists countrywide in a bid to stop them from welcoming Asif Ali Zardari, set to land at Lahore Airport tomorrow (Saturday). Also, dozens of PPP activists were injured and at least 100 were arrested during a clash with police at Karachi Cantt Railway Station on Thursday evening. Asif Ali Zardari, is the husband of Benazir Bhutto, who has lived abroad since 1997. He was imprisoned until late last year in Pakistan. This is his first trip back to Pakistan since his release. The misdeeds attributed to Mr Zardari range from the bizarre to the downright horrific. When arrested the first time, he was accused of tying a remote-controlled bomb to the leg of a UK-based Pakistani businessman, Murtaza Bukhari, and sending him into a bank to withdraw money from his account as a pay-off. In 1996, he was arrested under the Maintenance of Public Order Ordinance, but was soon charged with the murder of Murtaza Bhutto, his wife’s brother. Pakistan Peoples Party leader Asif Ali Zardari was detained in Islamabad as his airplane landed at the airport. SSP Rawalpindi Marwat Shah showed arrest warrants to Asif Ali Zardar as he get out of the airplane telling him that he was being taken to Adiala Jail and was arrested in Justice Nizam case. Earlier Anti Terrorism Court special judge Syed Pir Ali Shah had cancelled Asif Ali Zardari’s bail in Justice Nizamuddin and his son’s murder case and issued non-bailable arrest warrants against him. Policemen baton-charged PPP workers who were present at Islamabad Airport in hundreds. MMA Leader gave Zardari the OK to land in Peshawar as a gesture of good will. The Government of Pakistan is in the grip of total panic. The country in general and its biggest province, Punjab, has been put under a state of complete siege. Its law and order machinery, police and intelligence apparatus, is busy doing the 24-hour round and vigil, pulling down posters and removing walk-chalkings that have sprung up in the entire country with slogans welcoming Asif Zardari’s return home on his Journey for Democracy tomorrow, April 16. I have before me Dubai’s two leading English newspapers that monopolize the English readership of the Emirates. Reports on Pakistan by Khaleej Times (April 12) “Punjab slaps ban on public rallies” and Gulf News (April 13) “Posters welcoming Zardari torn down across Lahore city” have summed up the mounting unease among the rulers who are running berserk on the eve of Zardari’s arrival. the factual situation is that the government has imposed Section 144, banning holding of rallies, adding “this is for all.” He also dismissed the allegation that the government is following double standards by allowing the MMA to hold public rallies and disallowing the PPP-P. 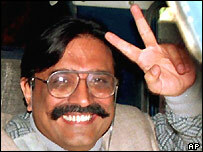 He said the government is neither upset nor nervous over Zardari’s return home. Update: (Friday AM) Thanks for the link, Great One! Like Instapundit says,… it’s hard to make out the situation right now but there were certainly many arrests made yesterday. I will keep an eye on it. With Zardari’s return to Pakistan, and a previously scheduled rally by the PPP, tomorrow ought to be interesting! Update 2: (Friday PM) Daniel Berczik at the great Publius Pundit has more information on the developments in Pakistan.